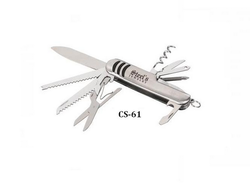 Among our wide range of products, we are providing a premium quality assortment of Victorinox Professional Outdoor Camping Swiss Army Knife. We all have faced those situations when we have missed having a mini toolkit. Whether it’s a trip or for daily use, the 15 in 1 Multipurpose Utility Knife puts an end to all your worries with regard to fixing objects or cutting stuff. High-quality stainless steel implements all fit into one tool. The Handyman becomes the one tool you’ll always be able to rely on. 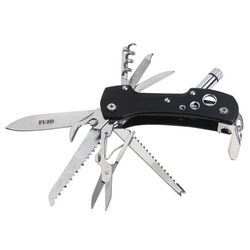 Being a prominent firm, we are affianced in providing our clients with a distinct assortment of Multifunction Swiss Knife. - 11 in 1 Swiss knife in beautiful black finish.